Z.com Review 2019: Is Z.com a Good Hosting? Z.com has an incredible reach that stretches from Asia all the way to Europe and North America, though they’re headquartered in Japan. You can host up to 30 WordPress websites at once on plans with robust storage, bandwidth, and lots of database support. However, your initial startup costs will be higher than most standard hosting. Z.com is part of the GMO Internet Group, a multinational corporation that’s been offering online services since 1991. They have an incredible reach that stretches from Asia all the way to Europe and North America, though they’re headquartered in Japan. They host over 750,000 websites and can accommodate anything from a small personal website to a high-traffic and resource-intensive e-commerce website. However, their WordPress hosting will be of particular interest to many users as these plans boast excellent features at a decent price point. Given Z.com’s size, it’s no wonder that they can easily accommodate any kind of website, both small and large. They also have localized versions of their web hosting service in different countries around the world, with slight variations in features and resources provided. Z.com has an optional proprietary cache system that you can use to increase your website’s load speeds. Also, they offer advanced security features such as IP address restriction, suspicious login blocking, and more. Z.com also provides a separate staging environment for WordPress websites, along with one-click website copy tools. You can copy your WordPress website from another provider to Z.com in just three steps. If you don’t want to use WordPress, there’s a paid website builder option available. These plans all offer excellent storage and bandwidth but be very careful on how many databases you use. Each WordPress website will use a separate MySQL database. If you max out your domains on these plans, you won’t have any databases to spare. On the surface, it appears these plans are reasonably priced. However, there’s an initial setup in addition to the monthly fee. Also, they don’t offer free SSL certificates. However, the added fee is minimal, so you’ll pay less for your certificates over other providers. They also don’t provide a free domain, so factor that into your costs. First-time users of Z.com get a 14-day free trial. Support for this product is somewhat limited. They offer phone support and ticketing support only. There is a reasonably robust knowledge base available, but it’s only available in Japanese. 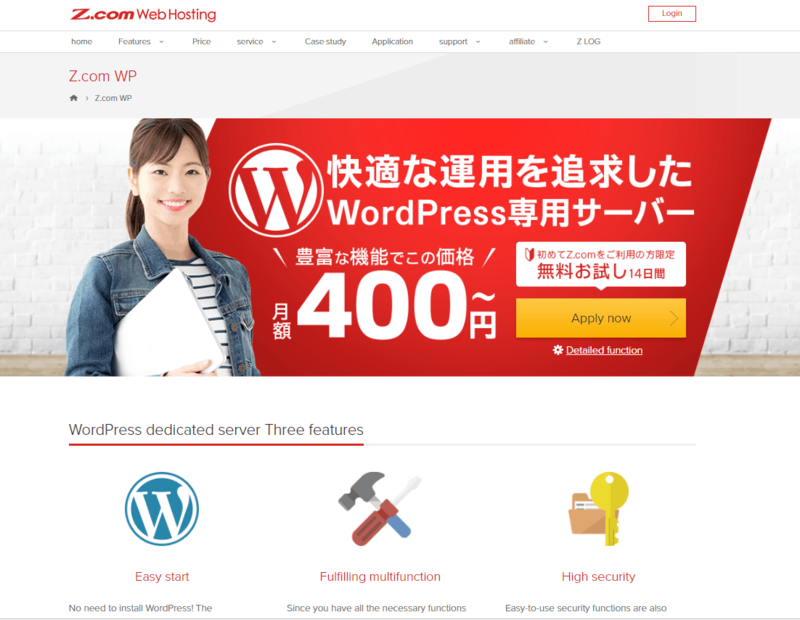 Z.com is an excellent choice for those looking for reliable WordPress hosting. While your initial startup costs will be higher than other providers, it’s worth paying a bit more to work with a solid hosting company. Check out Z.com’s web hosting options today! Wondering how Z.com stacks up against other Web Hosting companies? Enter any other Web Hosting company and we will give you a side-by-side comparison.